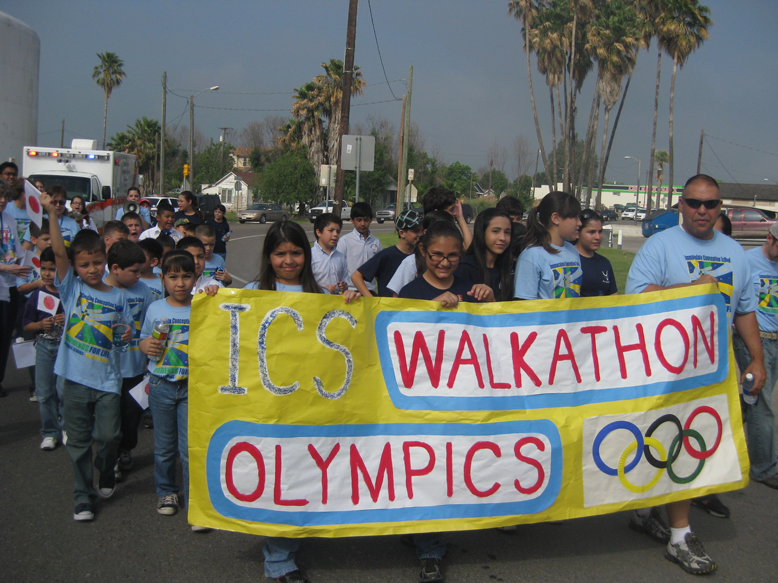 The Immaculate Conception School community, we would like to thank everyone for their support of our annual Walkathon. We had a great event this year integrating an Olympic theme. Each class chose their country for the Olympics, and they learned in depth the different facts about their country. Each day, the student body traveled around the world visiting these countries through bulletin board displays and presentations at morning assembly. Thanks go out to Mr. Hughes and the Walkathon Committee members, S. Armada, V. Santos, and C. Ivester for the success of the Walkathon, both as a public display of Catholic school pride and as a fundraiser for the Diocese of Brownsville and our school. A special thanks to Mrs. Silva for the beautiful banner for our All-star float. The two top pledge earners from each class were honored as All-Stars and allowed to ride the float during the Walkathon. The banner was also used to disclose the pledge totals at the Grotto at the end of the walk. This year’s Catholic Schools Week theme, “Dividends for Life,” draws attention to the many beneficial aspects of a Catholic education. In these tight economic times, the theme also reminds parents that these dividends – faith, knowledge, morals and discipline – truly are payable for life. There’s no better way to invest in a child’s future. I.C.S. currently has open registration for interested families who want to give their children the gift of Catholic education. Please come by the office or call 487-2558. To learn more about I.C.S., visit us online at www.icsrio.org.